Do you find yourself overwhelmed in public places or can feel other’s pain? Chances are you’re an empath. Embrace the positive aspects of this talent and get in touch with all of your emotions. Embrace your powers and thrive in everyday life. Follow this exercise below from THE EMPATH EXPERIENCE by Sydney Campos to see how you self-identify. on what it means to be an empath and the different ways this gift can influence your life in positive ways. 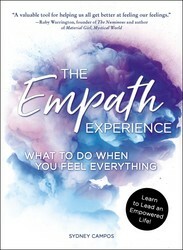 In addition, you’ll find supportive advice from a fellow empath on how to embrace the positive aspects of this special talent, get in touch with and understand your emotions, and tips and techniques to help you feel your best—even when someone else may be feeling their worst. EXERCISE: HOW DO YOU KNOW IF YOU’RE AN EMPATH? You feel other people’s pain. Physical, emotional, spiritual— you name it. When other people are feeling down, you automatically sense their feelings and even subconsciously take on that pain as your own. You can’t help it. You’ve always wanted to help other people and take care of them; it’s part of the natural fabric of your being. It’s who you are. You can read the energy – or “vibe” – of a room sometimes even before entering the space. You might also get overwhelmed easily when you’re in a crowded situation even for a few moments. You have powerful emotional response (even to the degree of making you feel enormously uncomfortable) to tv, movies, or theatrical performances. You may have even felt the desire to stop watching or engaging in whatever it was that you were viewing because the experience was too painful, almost as though it were really happening to you. You have taken on other people’s illnesses or physical maladies. These could include a cold, allergies, a cough, or physical pain or inflammation. Have you ever suddenly started feeling congested simply because someone around you is sick or has allergies? You experience intense exhaustion, especially after spending time with an individual or group that feels immensely draining on your energy. It can feel at times as though you attract certain people because you make them feel better just by your presence, and this interaction often leaves you drained, like you’ve given so much of yourself without receiving anything in return. You feel the collective pain and disease occurring throughout the entire planet. You resonate with the experience of carrying the weight of the world on your shoulders. You are highly attuned to the emotional consequences of violence, oppression, and separation on the global level. You feel responsible for saving the world as a result, because you can see how it might all be able to be fixed. You know when other people are lying. You can’t explain it, but you’ve simply always known. You can sense the energetic dissonance of others when they are embodying any type of dishonesty or lack of integrity. As such, you’ve had challenges with trusting people to the degree that you deeply desire. You’re acutely aware of how often people are dishonest, especially with themselves, and you can actually see and feel it. The challenge for you is to be able to not take it personally and consider that you may see something that the other person isn’t even yet aware of. You are sensitive to noise and light. Loud sirens, city noises, traffic, bright lights, and anything that carries with it a feeling of chaos, intensity, or possible confrontation puts you on high alert and can even feel extraordinarily startling. You may feel an aversion to city living, especially if you find yourself surrounded by huge buildings and concrete without easy access to nature or greenery. Your find yourself feeling incredibly healed and restored by nature, more so than anyone else you know. For you, nature is like medicine. You crave the space, peace, quiet, and natural sense of ease provided in expansive greenery, forests, beaches, and mountains. Being in nature nourishes you unlike anything else. Your senses are particularly activated in natural environments, where you may have even had the experience of accessing stronger intuition and psychic foresight. You may have learned at a young age to not say what you’re really feeling to avoid making other people uncomfortable. As a child, you learned to hold back on telling the truth because others, especially adults, weren’t able to receive the full degree of your honesty. You may have spoken something so true that others around you felt uncomfortable at having the light shined on an issue or question they weren’t prepared to face. Even if their discomfort wasn’t voiced, simply sensing the uncomfortable response in them might have made you subconsciously learn that it isn’t safe for you to speak your full truth. Empaths exist across a full spectrum of sensitivities and preclusions. There definitely isn’t one template to describe this truly unique experience that is felt across the mental, emotional, and spiritual/ energetic realms. However, if you identify with most or all of these circumstances, it’s highly likely that your empathic gifts are yearning to be identified and activated. You may sense you are ready to learn how to truly harness your abilities to become fully empowered, energized, and clearly expressed. You’re ready to get to know yourself (and your unique gifts) more deeply than ever before so you can live an incredible life marked by connection, confidence, and truth. Trust that the world is so ready for you. Want to learn more about being an empath? We’re here to help.